I don't know why I fell so hard for the Shoalwater Shawl. Something about liking the ocean and boating and fishing I guess. I worry that it will make me look 80 years old, but still, the minute I saw it I just had to have it, despite the fact that I never wear blue. Do you remember the Color me Beautiful concept that was popular in the eighties? It's a colour analysis system to find what colours suit a person. Although a useful tool, I have also found it very restricting. I have spent the past 15 years dressed in black and beige, and I blame it on CMB. I have a friend who went to beauty school in the early nineties, and when her class needed a guinea pig for colour analysis I considered myself lucky for gettting a free consultation. All 10 students and instructors were firmly agreed, beyound doubt, that I am an Autumn type, and must only wear warm autumn type colours. Cold colours like black, white, pink, bright reds, and you guess it, blue, were for ever banned from my wardrobe. In the early ninieties black was the obvious favorite colour for an intellectual wanna be like me, so I was quite distressed when it was forbidden too, but the instructor assured me that " you can get away with it while you're still young". Well, I'm 37 today - do you think I can still get away with it? Probably not, but she forgot to say that when you're 37 you don't care anymore what the beauty police says, so I'm still wearing black, but I'm also adding new forbidden colours to my wardrobe. So the beautiful Indian Summer colourway that I first bought for this shawl stays in the stash box, because clearly the Shoalwater Shawl must be blue. 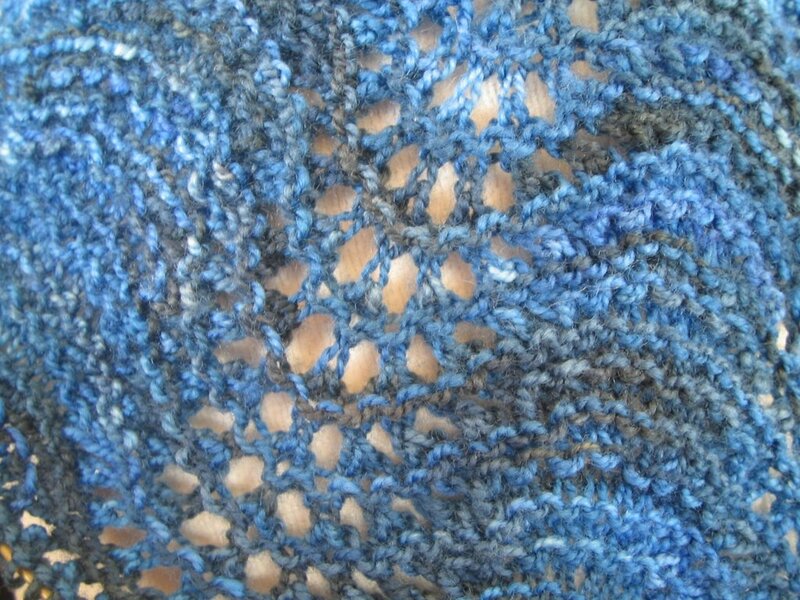 It was impossible to find the Cherub yarn from Wool in the Woods that is used in the shawl in the Fiber Trends picture above. I was looking around for different options when I came across Kelly's blog entries about choosing a yarn for the Shoalwater Shawl. 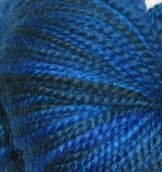 As Kelly had been looking for the same type colour and variegaton as I was, and was very happy with her choice, I decided to go with Cherry Tree Hill in the Moody Blue colourway too. And she was right. It's a perfect deep blue, with some darker, almost greenish black, patches that give it a very, uhm, marine look. Instead of the laceweight I chose the supersock yarn for a more rugged look. The supersock is very bouncy and elastic, I'm not entirely convinced that it's a good yarn for lace, but I trust the blocking will sort it out. 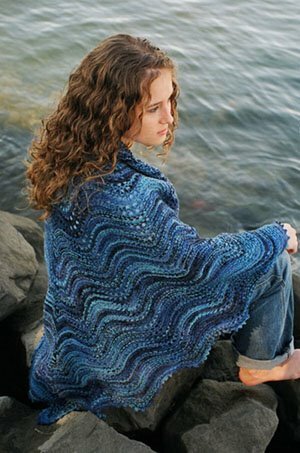 The shawl is designed by Evelyn Clark for Fiber Trends. It's garter stitch lace, and with three knit rows between every pattern row, it knits up incredibly quick. I started it Friday and have almost finished the second of a total of four repeats already. It is such a gorgeous shawl! I haven't been able to work on mine at all, but you have inspired me to pull it out again. It is my main goal for the coming summer break to have this finished. The yarn is spronging, but I feel like (from the little pining I've done)it will block out well. Congratulations on getting so far so fast!! I love that pattern too--it's waiting in my stash for just the right yarn. I think it really does demand a variegated; it wouldn't be nearly so pretty in a plain yarn. Your choice was excellent--it's a really close resemblance to the original! Do you mean it is your 37th birthday today, or are you just telling us because you are 37 you can do what you want?!! The shawl is lovely and the colour will look beautiful on you. Will look forward to the finished photo. It's absolutely fantastic, that shawl!! 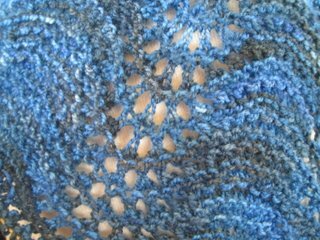 And of course it has to be knit in that gorgeous blue - never mind the know-hows from the past! HAPPY Bday MARIE! Hope you had a wonderful day.